“Shop the perimeter of the grocery store”. I bet you’ve heard people say this. If you have spent time in grocery stores, you will have noticed that the edges of the store usually contain fresh produce and other whole foods. The middle of the store, on the other hand, contains the freezer aisles. 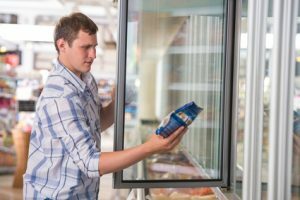 The old rule to shop the perimeter is based on the premise that frozen food is unhealthy. But is that true of all frozen foods? Should you really stick to the perimeter of the store? Are there any healthy options in the middle? Are There Healthy Options in the Freezer Aisle? The short answer is … absolutely! The freezer aisle contains plenty of healthy options. And one of the most underused options is the frozen produce. Fruits and vegetables are an extremely important part of any healthy diet. According to the United States Department of Agriculture, we should be eating 2½ to 3 cups of vegetables and 1½ to 2 cups of fruit every day. However, less than ¼ of Americans consume enough fruits and vegetables, and that number is declining. So why is that, and how can the freezer aisle help? Fresh produce can be expensive, and can go bad if not eaten quickly enough after purchase. Neither of these factors encourage people to increase their intake of fruits and vegetables. However, the freezer aisle is an excellent, and often ignored, source for fruits and vegetables that are both convenient and cost-effective. Despite this, only 1.6% of the fruit and 14% of the vegetables eaten in people’s homes are frozen. Many people think that frozen produce is inferior in quality to fresh produce, or that the process of freezing adds chemicals to the food. However, neither of these beliefs is true. In general, it is time that makes produce lose its nutritional value. When produce is picked to be sold fresh in a supermarket, it is picked before it is ripe to allow for travel time from the field to the store. That means that the produce has not reached its full potential in terms of vitamin, mineral, and antioxidant content before being picked. Then, during the time in which the items are shipped to the store, displayed on the shelf, and transported to someone’s home, the level of nutrients declines. Frozen produce, on the other hand, is picked when it is ripe and frozen very soon after picking. In some cases, fruits and vegetables are frozen within one hour of being picked. The freezing process puts a hold on the decline of the nutrients. The result is that frozen fruits and vegetables are as nutritious, or even more so, than fresh produce. Are There Chemicals In Frozen Produce? As for the fear of chemicals, none are used in the freezing process. Before fruits and vegetables are commercially frozen, they are washed in clean water. They are then frozen without the use of additives or any other chemicals. They may be cut or blanched (put briefly in boiling water to stop enzyme activity), but other than that, they are frozen unadulterated. The only processing involved is the freezing itself. So what is not to love about frozen produce? It is nutritious, affordable, convenient, easy to prepare, and reduces food waste because there is no chance of it rotting in the crisper drawer of the fridge. Overall, it is an excellent way to help reach the daily recommended intake of fruits and vegetables. When buying frozen fruits or vegetables, check the ingredient list to make sure the package contains nothing but the fruits or vegetables. If you see added sugar, salt, sauce, or other ingredients listed, put it back and select something else. Thanks for sharing the information. Very helpful! I’m so glad you found it helpful 🙂 Thanks for stopping by. What a great, well written post! I think a lot of people worry about frozen vegetables and fruit, and it’s great that you’re informing people that they’re still just as nutritious!